. This can help you create highly customizable, comprehensive, and scalable reports to audit and analyze G Suite usage and adoption. Create highly customized reports. BigQuery enables more customizable reports than those available in existing pre-defined reports in the Admin console. Keep and analyze a longer data history. BigQuery enables indefinite data storage (existing Admin console reports cover 180 days) to help long-term trend analysis. Join Google apps data with other data sets. BigQuery enables users to join other data sets, for example Payroll or Finance, to create comprehensive reports. Analyze individual activity behavior information for Admin, Calendar, Devices, Drive, Login, Groups, oAuth Tokens, and SAML Audit logs, as well as any forthcoming updates to the Reports API. Report aggregated usage metrics for Accounts, Google Drive, Chrome OS, Classroom, Calendar, Google+, Hangouts, Device Management, and Gmail, as well as any forthcoming updates to the Reports API. Perform advanced analysis using the BigQuery web UI, command line, or third party tools. Create custom reporting and dashboards using analytics tools like Google Data Studio and other visualization tools supported by BigQuery. Scalability: Customers don’t have to worry about storage limits and can store hundreds of terabytes of Google apps usage and audit data. 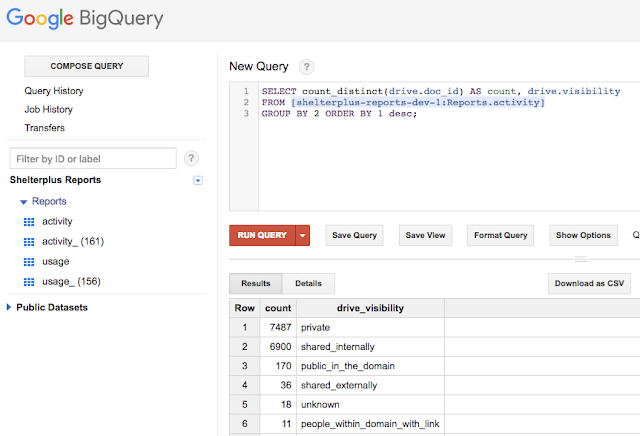 Simple querying interface: BigQuery allows SQL-like queries to build highly customized reports without writing any code. Out-of-the-box reporting: BigQuery’s integration with various data visualization applications allows enterprise firms to generate engaging reports without custom development. Pay only if you use: BigQuery bills customers based on the number of queries that they make against their data, so billing is closely linked to actual usage. See more about BigQuery costs. See our Help Center to find out how to get connect your G Suite data to BigQuery. 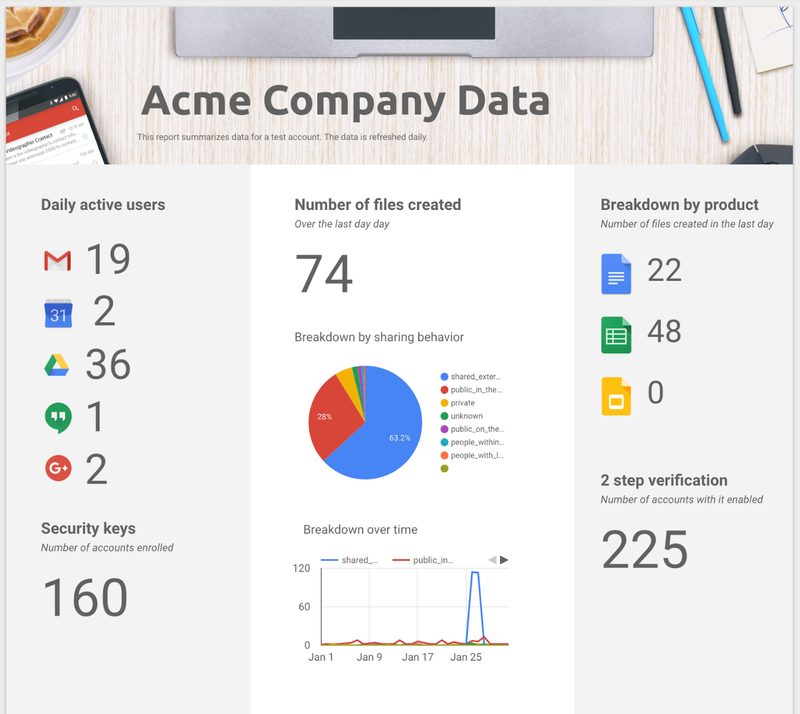 We’re making it easy for G Suite Enterprise customers to move G Suite reporting and audit data from the Admin console to Google BigQuery. This can help you create highly customizable, comprehensive, and scalable reports to audit and analyze G Suite usage and adoption.